(d) No Forfeiture. A party’s failure to file and serve the notice, or the court’s failure to certify, does not forfeit a constitutional claim or defense that is otherwise timely asserted. Rule 5.1 implements 28 U.S.C. §2403, replacing the final three sentences of Rule 24(c). 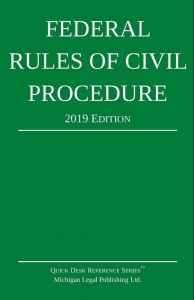 New Rule 5.1 requires a party that files a pleading, written motion, or other paper drawing in question the constitutionality of a federal or state statute to file a notice of constitutional question and serve it on the United States Attorney General or state attorney general. The party must promptly file and serve the notice of constitutional question. This notice requirement supplements the court’s duty to certify a constitutional challenge to the United States Attorney General or state attorney general. The notice of constitutional question will ensure that the attorney general is notified of constitutional challenges and has an opportunity to exercise the statutory right to intervene at the earliest possible point in the litigation. The court’s certification obligation remains, and is the only notice when the constitutionality of a federal or state statute is drawn in question by means other than a party’s pleading, written motion, or other paper. The Advisory Committee debated at length the question whether the party who files a notice of constitutional question should be required to serve the notice on the appropriate attorney general. The service requirement was retained, but the time for intervention was set to run from the earlier of the notice filing or the court’s certification. The definition of the time to intervene was changed in tandem with this change. The published rule directed the court to set an intervention time not less than 60 days from the court’s certification. This was changed to set a 60-day period in the rule “[u]nless the court sets a later time.” The Committee Note points out that the court may extend the 60-day period on its own or on motion, and recognizes that an occasion for extension may arise if the 60-day period begins with the filing of the notice of constitutional question. Several style changes were made at the Style Subcommittee’s suggestion. One change that straddles the line between substance and style appears in Rule 5.1(d). The published version adopted the language of present Rule 24(c): failure to comply with the Notice or certification requirements does not forfeit a constitutional “right.” This expression is changed to “claim or defense” from concern that reference to a “right” may invite confusion of the no-forfeiture provision with the merits of the claim or defense that is not forfeited.